Nazeer, his wife Nazeema and son Nyzar are of a small family. The husband works in a private company and the son having done his GCE (A/L) wanted to do a foreign job. 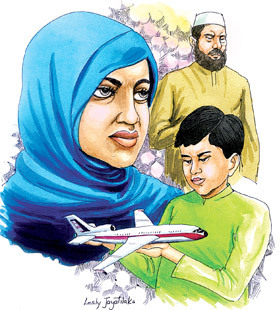 Both mother and son have a fear for the Almighty Allah and involve in religious activities. But the father is not so but will attend only the Friday prayers. Nazeema has an ambition of performing ‘Haj’ and will often talk about it. But of what use when they do not have enough money for it. The mother being pleased, told Zyzar, “My dear son, those words of yours itself is enough to me. I hope Allah will help you in getting the job. Your father is a sick person and he depends on his job for our survival. He encourages me to perform ‘Haj’ though he does not pray Allah and do the other religious necessities. As assured he gets a job in Abu Dhabi and leaves his parents with the hopes that all financial difficulties would come to an end in a few years time. The son being a talented boy rose to a good position in his company as the staff was also fond of him. The promotion gave him a bigger salary and after sometimes he sent the necessary funds to his mother to perform her ‘Haj’. The parents were overjoyed by the kind deeds of their son. The mother attended to all the pre-arrangements of the ‘Haj’ matters and finally booked the plane ticket. The departure was just two days before the incident of the crane that crashed in the Mecca mosque which killed over 100 and injured over 200. Nazeema strongly telling him not to be a fool, added, “Do not imagine death in such a way. Only Allah knows when and where to get the life. Do not you remember how your pious brother died? He was praying in a mosque when he collapsed. Allah should have not done that to a ’good Muslim’ praying for Him, yet Allah did because He needed his life at that particular moment. May be there is a vacancy to such a pious man in the heaven at that particular moment. “Ask your forgiveness from Allah. He will definitely forgive you. Trust Allah for everything to be good.” Nazeer was mute. “My son will be eagerly awaiting for my ‘Dua’ (asking from Allah) for him from Allah from that holy mosque. Therefore, I shall go as for the arrangements.” She concluded. The following day when Nazeema was going to a shop crossing the main road she met with an accident and succumbed on the spot. Nazeer then realized the words of his wife who said ‘only Allah knows when and where to get the life.’ The Almighty and All-knowing Allah gave the chance to the husband to see her face and at the sometime the full merit of ‘performing ‘Haj’ was bestowed to Nazeema as her intention was very clear to anyhow perform the Haj.’ Since that day Nazeer too started a pious life. Birth one way but death could be of different ways. May Allah protect all human beings from all risks. Let His kindness and mercy be to all the mankind.